Yesterday I discussed a little about this past year and the background to Saige and Zac’s nursery. Now for the nursery reveal! I had seen these hot air balloons at a trade show and fell in love with them long before I was even pregnant. I love that they looked vintage, were colorful and added a sense of whimsy to a room. When planning the nursery they became the inspiration for the rest of the room. I also felt that they were gender neutral, and perfect for a shared space. 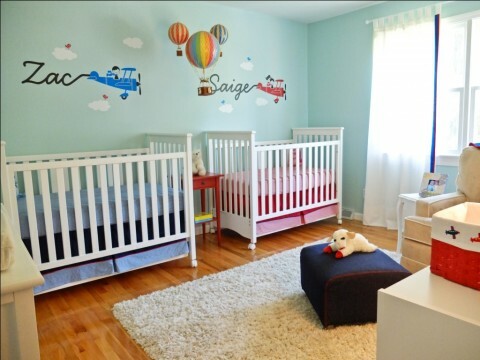 Next I wanted decals above the cribs. I did not want to hang artwork over the cribs for fear it could fall on the babies. I searched etsy and found these boy and girl airplane skywriters from Graphic Spaces. They had a similar whimsical, vintage look and worked with my Up, Up & Away Theme. I wanted the nursery to feel cheerful and thought it was so cute that the boy and the girl each had a big smile. I thought about getting this twin seater which is super cute, but decided instead to have their individual names over their cribs. It took me a long time to find the right bedding, and ended up designing it on my own. I did not want to have the same bedding for Saige & Zac, but rather wanted coordinating bedding. I ended up going with a red combination for Saige with navy piping, and a navy combination for Zac with red piping. Although I prefer the look of bumpers, I decided not to buy bumpers based on the recommendation of the American Academy of Pediatrics. The rest of the room pretty much fell into place. Budget was important, so I was thrilled with my bargain buys. The curtains are from Ikea. Purchased simple ivory canvas tab top curtains and sewed navy and red ribbon trim that I found at Michael’s. The red accent table, ottoman, and shelves are also from Ikea. The bookcase is from Walmart and cost a total of $16.99! The lamp is from Target and was also only $16.99. The rug is from Costco. I was looking for a soft shag rug. The room already had enough color so I wanted a simple Ivory rug. Most shags I found were $400-$500 or more. This one was $150…a great find. The pillow on the chair and the airplane basket were Home Goods finds. While looking for artwork for the room I came across this ‘Dreams’ art print from HarperGrace on Etsy and found what it said to be perfect. She had 2 different ones for a boy and a girl, but was nice enough to custom design it to be gender neutral. Like the artwork says, my wish for them is to act like kids…to fly a kite, jump in puddles, lie in the grass, slay dragons, and continue to imagine and Dream Big! The hand and foot prints were a mold I received as a gift. The mold came on its own so I purchased frames, and had white and navy mats cut to size. Another favorite find is the knobs on the dresser, from Feather and Wind also an Etsy find. I emailed her asking for a navy and white design and she custom designed these for me. I hope you enjoyed reading about this nursery as much as I enjoyed designing it. For more information regarding product see this detailed list on project nursery. You can also post a comment and I will be happy to answer it. Beautiful nursery!! I was wondering who made your bedding? Thanks! Thank you Kirsten! It was actually custom designed with Carousel Designs since I could not find coordinating bedding that I liked. Squeal! Those hot air balloons are amazing! Are they heavy? How did you manage to hang them from the ceiling? Absolutely adorable! Thank you so much!!! No, they are not heavy. I used what it came with to hang them. Looks like a finishing line so you do not see it. My twins love watching the balloons spin. Thanks so much Lisa! I just ordered a few for our playroom! So are they light enough to use a thumbtack or did you have to use a screw in your ceiling? I used screws and painted them the ceiling color. The large one is a bit heavy, but was easy to hang. I would love to see pictures of the room once finished. Thank you…the hot air balloons are from authentic models and I bought them through Mookie Gifts. I got one of the large and 2 medium. I don’t remember the exact price but I believe the large was about $70 and medium about $40. Thank you so much for the detail you provided here. This is a beautiful room! I fell in love with the hot air balloon idea when I was pregnant with my daughter three years ago but decided to go in a different direction but now pregnant again, I think I need to go for it! Thanks again.